Signs of political discontent are increasingly common in many Western nations, with anti-establishment parties and candidates drawing significant attention and support across the European Union and in the United States. Meanwhile, as previous Pew Research Center surveys have shown, in emerging and developing economies there is widespread dissatisfaction with the way the political system is working. However, this skeptical outlook on government does not mean people have given up on democracy or the ability of average citizens to have an impact on how the country is run. Roughly half or more in eight nations – Kenya, Nigeria, South Africa, the U.S., India, Greece, Italy and Poland – say ordinary citizens can have a lot of influence on government. Hungary, where 61% say there is little citizens can do, is the lone nation where pessimism clearly outweighs optimism on this front. Many people in these nine nations say they could potentially be motivated to become politically engaged on a variety of issues, especially poor health care, poverty and poor-quality schools. 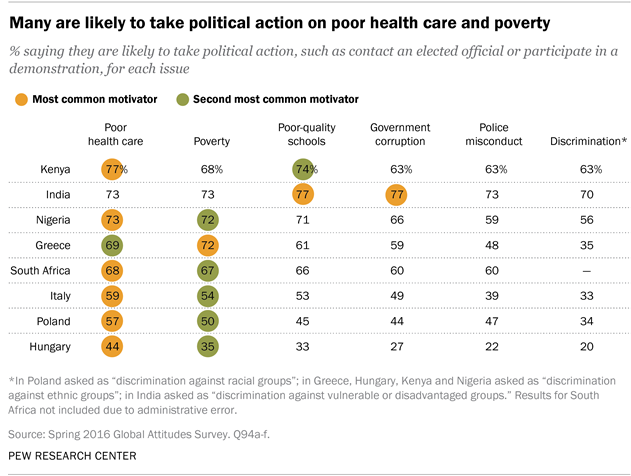 When asked what types of issues could get them to take political action, such as contacting an elected official or taking part in a protest, poor health care is the top choice among the six issues tested in six of eight countries. Health care, poverty and education constitute the top three motivators in all nations except India and Poland. These are among the key findings from a new Pew Research Center survey, conducted in nine countries among 10,828 respondents from March 29 to July 9, 2016. Four EU nations are included – two (Greece and Italy) that have struggled economically in recent years and two (Hungary and Poland) that are former communist countries and have recently experienced substantial support for nationalist political leaders. Three of sub-Saharan Africa’s most important political and economic hubs are also included – South Africa, Kenya and Nigeria. In addition, the survey includes the world’s two most populous democracies, India and the United States. Even though these nine nations are very different, there are many common themes in their views about political participation. Chapters 1 through 3 explore in detail the findings for each region and country. Individuals in these nine nations engage in a variety of political activities, although voting is the most common by a wide margin in each country. The highest percentage saying they have voted in an election at least once in the past is found in Greece, which has compulsory voting, at 91%. The lowest percentage is also found in Europe: Hungary, at 72%. Some also say they engage in other traditional forms of participation, such as attending a campaign event or volunteering. 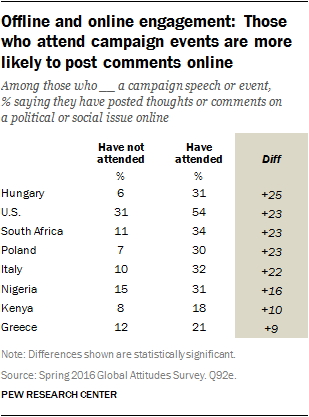 Kenya has the largest share (49%) who say they have been to a campaign event. Living up to their reputation for volunteerism, identified long ago by Alexis de Tocqueville, Americans (54%) are more likely than others polled to say they participate in volunteer organizations. In addition to these traditional forms of engagement, significant minorities have taken to the streets to express a political viewpoint. The percentage who say they have participated in an organized protest ranges from 7% in Hungary to 29% in Greece. The internet’s tremendous potential for providing online platforms for political engagement has garnered considerable attention in recent years from journalists, scholars and practitioners. Notable numbers in these nine nations are engaging in online activities such as posting political comments, encouraging others to get involved in politics and signing online petitions. 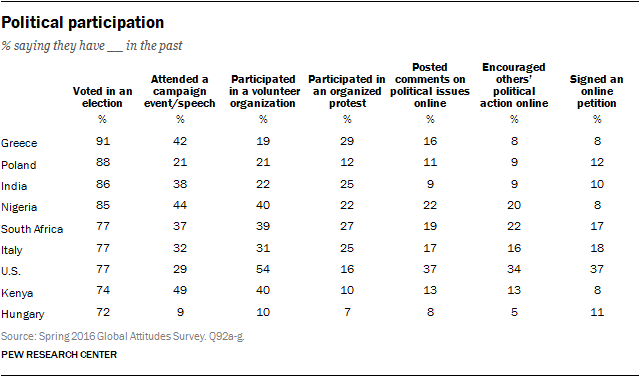 In the U.S., more people report having done these online activities than having attended a campaign event or protested. However, in many of the other countries polled, online forms of engagement are less common than traditional methods or protesting. Of course, in several nations – especially India and the three African countries – internet usage is still relatively low. Political participation also varies along generational lines. For example, voting tends to be more common among older people. In every country except Italy, those ages 50 and older are more likely than 18- to 34-year-olds to say they have voted. 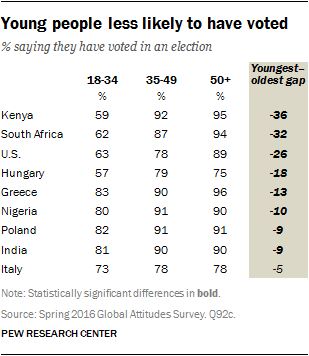 Of course, younger people may have experienced fewer elections than older people and thus had fewer opportunities to vote, but in most of these nations younger people also typically turn out to vote at lower rates. In contrast, online engagement is generally more common among the young. In six of nine countries, 18- to 34-year-olds are significantly more likely than those 50 and older to say they have posted their thoughts about political or social issues online. Similar trends are found for signing petitions online or encouraging others online to take action on political issues. While the internet and mobile technology offer new platforms for political engagement and the potential to bring new people into public discussions of important issues, many of the people getting involved in politics online are the same people who are politically engaged offline. To take one example, people who have attended a campaign event – a traditional offline form of political participation – are also significantly more likely to post political comments online. This pattern is found in eight countries polled. In the U.S., for instance, 54% of those who have gone to a campaign event have posted comments online, compared with only 31% of those who have not attended a campaign event. Similarly, people who have attended these types of events are also more likely to sign online petitions and encourage other people to get involved in politics online.